45 in stock Need More ? 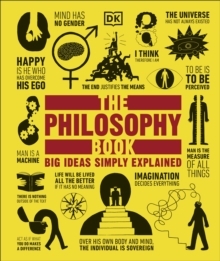 Explaining more than 100 of the most important big ideas and groundbreaking theories of key philosophers in a clear and simple way, this is the perfect introduction to philosophy and the history of how we think. Untangling knotty theories and shedding light on abstract concepts, The Philosophy Book makes use of innovative graphics and easy-to-follow explanations to demystify complex ideas. Explore the history of philosophy, from ancient Greece and China to today, and find out how theories from over 2,000 years ago are still relevant to our modern lives. Follow the progression of human ideas and meet the world's most influential philosophers - from Plato and Confucius through Descartes and Mary Wollstonecraft to Wittgenstein, Chomsky, and Derrida. With clever illustrations, clear explanations, a philosopher directory, and a vocabulary glossary, The Philosophy Book is a perfect and comprehensive introduction to a fascinating subject.